The Alberta Centre for Injury Control & Research (ACICR), together with Preventable Alberta and the Northern Alberta Institute of Technology (NAIT), are using a hard-hitting campaign to create awareness among students, staff and Albertans about personal and workplace safety. Alberta has one of the highest rates of preventable injuries in Canada. These injuries account for more premature deaths than any disease in the province, which snowballs into major cost burdens on the health system, substantial losses of productivity and, most importantly, personal and family hardships. To challenge these statistics and work towards a safer province, ACICR and Preventable, with support from NAIT students and staff, have brought to life an important awareness campaign focusing on personal safety and preventable injuries both at work and at home. 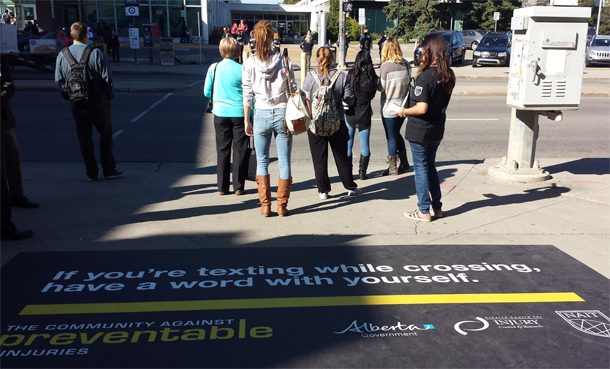 From impactful mirror, mobile and elevator applications, with statements such as “No one expects to end the day by causing a horrific car crash,” and “If you’re texting while walking have a word with yourself,” these partners encourage students, staff and all Albertans to stop and think about their behaviours and attitudes. NAIT is the first post-secondary institution in Canada to partner with ACICR and Preventable. Running September 15 to November 15, the campaign is intended to benefit Albertans by creating an understanding of how safer behaviours reduce injuries that contribute to costs associated with emergency departments, hospital care, disabilities support and law enforcement. In tandem with their workplace safety campaign, Preventable will also launch its rousing distracted driving commercial on September 5. Designed to draw attention to the recent influx of driving and texting-related fatalities, the advertisement will also encourage Albertans to stop and think about their actions.